I desided to take my friend out the Huashan creative park. They loved it there. There were lots of old buildings, smoke stacks, wierd lighting, crumbling walls of bricks and boarded up windows. The place definitly attracts the art crowd. While we were there we met a tap dancer, high school dance group and several people setting up a photography art exhibit. It's a public park so it's always open for strolling around at night for a chat or photos. And when your hungry or thirsty, there are a few restaurants to quinch your thirst or fill your belly. 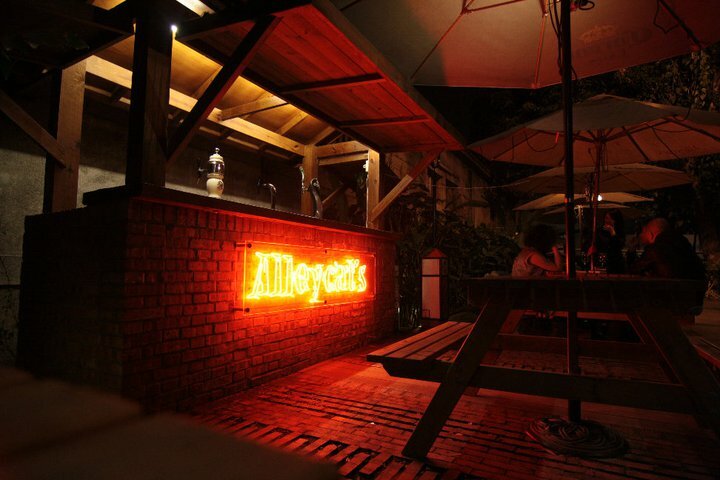 Alleycats has brickoven pizza and a fine beer selection. They closed at 11pm but stayed open an extra half an hour for beer patrons. We opted for some coffee, coke and of course beer. But made a mistake of sitting outside. We were eaten alive by mosquitos. I think i'll opt for indoor seating next time.